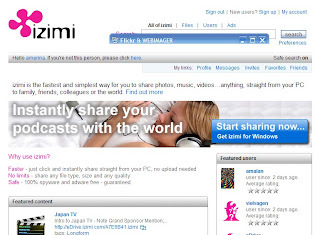 Izimi is a special internet publishing site, that helps people to publish and serve files, photos, music and videos, easy to share them with friends without upload. Izimi call itself is the future of Internet publishing. Free join it, and before you publish your stuff you need download an application. You do not need upload your files, just simple pick which file you want to publish or share with your friends. Izimi application direct link and store that file to its site, only thing you need to do is send a link to your friends, receivers can use their browser click link to watch your stuff ( pictures, video, music ). It is cool.